Desired and promoted by the Fondazione Pistoiese Promusica, the Orchestra Leonore was founded in 2014 as a manifestation of the specific idea of ​​making music together as an act of true sharing. This common goal unites excellent musicians, actively involved in prestigious chamber ensembles and with experience gained in important international orchestras (such as Lucerne Festival Orchestra, Berliner Philharmoniker, Orchestra del Teatro alla Scala, Accademia di Santa Cecilia, Mahler Chamber Orchestra, Chamber Orchestra of Europe, Orchestra Mozart, Sydney Symphony Orchestra), led by Music Director Daniele Giorgi. 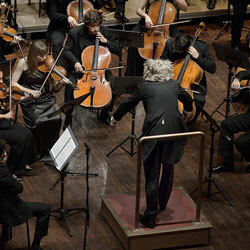 Since its debut, the Orchestra Leonore has garnered the attention of the music world on a national level due to the extraordinary energy and ease of its performances and for the joyful understanding present among its musicians (“That which seemed a utopia, a group of (beautiful) people has made a reality. Of sound. And of such quality!”- Helmut Failoni, Corriere Fiorentino). Already from its second year of activity, the Leonore received invitations to perform for several important concert seasons in Italy. Soloists such as Isabelle Faust, Alban Gerhardt, Gabriela Montero, Olli Mustonen, Nemanja Radulovic, Baiba Skride and many others have performed together with the Orchestra Leonore. Beginning with the 2017-2018 season, the musicians of the Orchestra Leonore are involved in “Floema”: a chamber music project, running parallel to the Symphonic Season, through which cultivated or “art” music reaches unusual places. The Floema project develops collaborations not only with all the main cultural realities of the city and the province but also with hospitals, prisons and schools. Projects are also carried out together with amateur music groups present in the area and with music school students. Floema also focuses on the commission and performance of dozens of contemporary compositions each year.